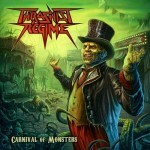 Share the post "Album review: THRASHIST REGIME – Carnival Of Monsters"
You return home from work tired, you had people yelling at you all day, your kids are crying because you didn’t bring them the new Lego with the millennium falcon expansion, the wife is giving you the eye and all your plans of relaxing and having some well-deserved fun take a back seat. Fear not because Thrashist Regime are here to the rescue. If you want to leave your troubles and worries behind for a while and just have (quality) fun then “Carnival of Monsters” transports you into a series of insanely joyful rides and by the end of the tour you will feel rejuvenated and most probably seek the entrance of this monstrous carnival to have another go. Lyrically, these guys from Scotland are doing a fine job setting the mood with beloved 80’s fun themes of mutant ants invading Antarctica in “Antarcattack”, alien forces threatening humanity in “XCOM:Enemy Unknwon” (finally a song for this classic video game), giants of immense proportions stomping everything in “Colossus”, fighting off hordes of zombies in “Headshot” where every riff counts, cursed knights wreaking havoc in “Vengeful Knights” and even the A-Team and Dolph Lundgren come into play in “Soldiers of Fortune” and “Operation: Keep him Busy” respectively. That’s all good but what about the musical aspect? Well, you don’t have to be Sherlock Holmes to figure out that this is a Thrash metal band but what is a defining difference with this album is, while you can sense from the song titles that this is a fun record, the band is the perfect musical host walking you through this carnival of monsters not lacking at all in the musical department. This is not just a ‘let’s have a few laughs while drinking a couple of beers’ kind of a band. These guys are more than capable of delivering tight guitar playing with all the relentless riffs and blistering solos you need and with melodies and hooks present, along with fitting drums and powerful menacing vocals and gang shouts. Songs clock a lot more than the 2-minute average duration of similar lyrical minded bands and are actually developed into full-fledged beasts. The production is solid; I especially like the guitar tone and the vocal performance of Mr. Joe Johnston but the entire band performs admirably. Right out of the gates “Laughter Then Madness Then Death” sets the level high with this instant hit and the aural assault just doesn’t let up throughout the record with the pace kept mostly at high speeds, intending to wreak your neck (and you loving it) and “Metacidal Massacre” calling it a day with a set of beautiful solos. Credit must also be given to the entire effort the band has put into not only making quality fun U.S Thrash metal songs, but putting out a record complete with all the fine but necessary and welcoming details such as a marvelous cover art and a booklet full of equally great art. This doesn’t feel like a self-financed or small label stuff, but rather like something that would have come out of one of the big metal labels out there in every respect. I haven’t been this excited about a Thrash metal band from the U.K since Evile came out. This is indeed a monster of a record. It’s fun delivered with style and class. If you are into this kind of music then this album should be in your purchase list.